I assumed they called this delightful, human-scaled, audio exposition Capital Audiofest because it is held near our Nation's capital in Rockville, MDbut alas, I think I was mistaken. It appears it is because every sleeping, exhibition, or conference room at the Rockville Hilton had a big digitized photo of some Roman Corinthian capitalsevery one! Or perhaps that is just some sly, tongue in cheek, ironic illusion to "All roads lead to . . ." But I was not mistaken about the delightful and human-scaled part. 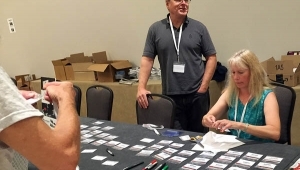 Founder and organizer Gary Gill has open arms and a big smile that always makes everybodyattendees, vendors, and the pressfeel very welcome. The vibe is sweet all around, and I swear, it even makes the music in the rooms sound better. 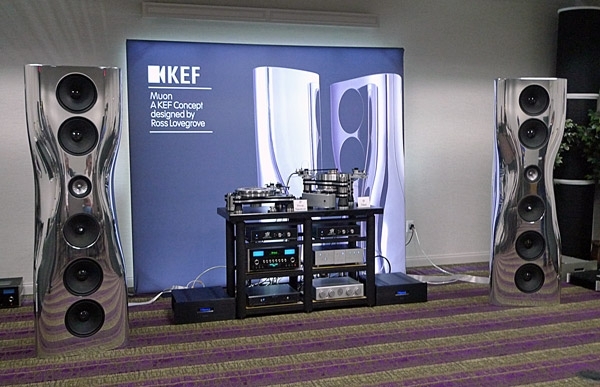 The opening-day buzz at CAF was all about the Mk.2 version of KEF's giant, chromed Muon loudspeakers. Styled by Ross Lovegrove, the Muon is like those concept cars we all love at the car showsit had a big quotient of wow-factorbut everyone in the room knew they would never get to drive them home. But with the Muon, at least we could touch and listen. Interestingly, this was not a premier, but more of an unveiling. The Muons are not for sale (yet? ), but will be priced at $225,000/pair. As at the Munich show last May, KEF kept the Muon behind a curtain so listeners could hear it and respond objectively without seeing their faces reflected in its gleaming like surface. Big and shiny as these KEFs were, they could not upstage the good ol' down-home dog-and-pony show featuring Johan Coorg (KEF), Harry Weisfeld, Mike Bettingger, and the always effervescent Mat Weisfeld (VPI). With lots of smiles, "shush, don't-tell-anybody" stories, and nuts-and-bolts engineering talk, the vibe was fun and smart. 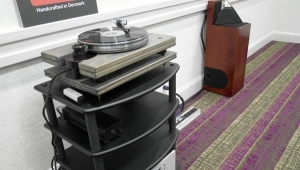 What we could buysoon, at leastwere three new turntables from VPI. The first, big, killer one was leaked on Facebook. It is called the VPI Titan (above). It is air-suspended, and costs $48,000. 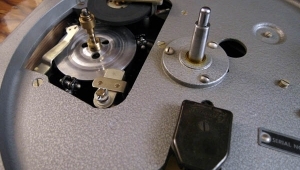 The Titan has two motors, with two belts, driving an idler wheel pressed up an Avenger-type magnetic subplatter, which in turn drove VPI's biggest platter. I remember thinking when I saw the Facebook photo, wow and flutter must be unmeasurable, but that must have been a dream or a premonition, because Harry Weisfield said exactly that as he was changing a record. (Déjà vu all over again?) The second big VPI introduction was the Prime Signature turntable ($6000), which is scheduled to be in full production by November and will replace the venerable Classic Signature. Obviously, the VPI family has been working a lot of overtime tying to keep up with all those LP presses that have been grinding out black discs 24/7. In addition to the Titan and the Prime Signature, there was a new entry-level record player to replace the Nomad called the "Player" ($800+), a new ADS (Analogue Drive System) speed controller, which is VPI's update and replacement for the SDS. It was designed by Mike Bettinger and will be available in several power levels at $300$500, $1000, and $1500+ price points. 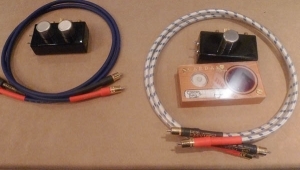 Also designed by Mr. Bettinger were the Cliffwood phono stage and a headphone amp (each under $1000). Think big room, big sound, and big personalities. In the Legacy room they were playing "St. James' Infirmary Blues" by Pete Schneider and the Simulators and what's not to like about that groove? The big Legacy Aeris speakers ($20,735/pair) were marching along with this classic American folksong that had been made famous by the master (Louis Armstrong), and I was digging the feelings it inspired. The Aerises were driven by the Raven Shaman Mk.2 300W monoblocks ($9995/pair), Silhouette Mk.2 Reference preamplifier ($15,995), and a Wavelet music server ($NPA). All cables were Douglass Connection "Alpha Rhodium 2." 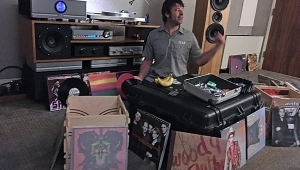 Every audio show I attend, I visit Brian Zolner of Bricasti designhis room is always an oasis of big, clean, relaxed, low-distortion sound. He always uses Tidal loudspeakerswhich consistently load a big room in a most convincing and satisfying way. This time Bryan used the Agorias ($105,000/pair) and the rightleft imaging and clarity were spectacular. 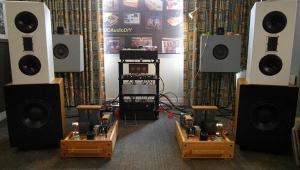 The speakers were powered by the Bricasti M28 monoblock amplifiers ($30,000/pair), the M12 Dual-Mono Source Controller ($15,995), and M1 Limited-Edition D/A peocessor ($15,000). Cable was by Oyaide, power was supplied by Silver Circle Audio's Tchaik 6 conditioner ($10,000). Mr. Zolner never plays hapless audiophile craphe always goes for big, strong, and complex musical program and the results are consistently stunning. No matter what equipment they play, retailer Command Performance AV out of Falls Church, VA always makes big, intense, sensational sound. This year was no exception (well maybe it was slightly better than usual). I am a fan of red loudspeakers, and I am a fan of Focal speakers, and these red Focal Sopra No.2 speakers ($13,999/pair) really made me smile and relax. But they also had this livelyvery spiritedpunch and pop type presentation that brought a nice life to every recording. The Sopras were powered by a Micromega N-One 100 integrated amplifier/DAC phono/streamer ($4999), an Aurender N10 Music Server ($7999), an AMG Giro Turntable ($10,000) with a DS Audio Optical Cartridge and phono stage. 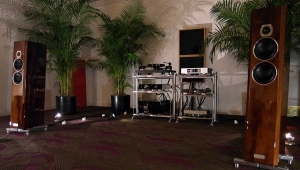 This system was plugged into a Vibex Generalife power conditioner ($1695) and connected all around with Ansuz cables. In my report from the 2016 AXPONA, I wrote a whole blurb about how I thought the Border Patrol room had the best sound of show, but I couldn't turn it because I had forgotten to take photos. (Sorry Gary Dawes.) This time, however, Gary had two rooms and maybe they both will win that honor. The loudspeakers were different in each room, but the sound quality and music quality were equally wonderful in both. The first Border Patrol room featured Daedalus Audio Athena V.2 floorstanding loudspeakers ($11,850/pair) in a super-deluxe wood finish. 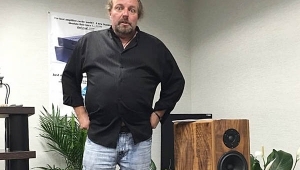 They were driven by the PX20 EXD Border Patrol push-pull 300B monoblocks ($16,750/pair), a Border Patrol Control Unit line stage ($6500), and Gary's excellent no-oversampling/no-digital-filtering DAC ($1250)all of which were sitting on the new Daedalus Audio "Daedalus isolation Devices" (DiD) priced at $480 for a set of three. The second Border Patrol room featured the wildly over-achieving and vivid-sounding Living Voice OBX-RW loudspeakers ($11,800/pair). Instead were driven by S20 EXD Border Patrol parallel single-ended 300B monoblocks ($16,750/pair) and a 1543 DAC ($1500). This was only my first day, but damn! The sound was really good in both rooms. Border Patrol might win my "Peace and Crickets" prize for Best Sound two show in a row. I also really enjoyed the Legacy Aeris- the cymbals were so real, I wanted to walk up and touch them. I didn't hear a trace of boominess- just deep and tight bass. The only other system I found worth comparing was the big $225,000 KEFs. Great show- thanks for the great coverage!